Coming together in the Muswell Hill area of London, Fairport Convention were heavily influenced in their early days by US West Coast outfits like Jefferson Airplane. From the Spring of 1967 through till November of the same year they were a regular attraction at London's Underground venues like The Middle Earth and The UFO Club. After their interesting debut album Judy Dyble departed to form Trader Horne, being replaced by Sandy Denny from The Strawbs. What We Did On Our Holidays was an excellent and diverse album, but it marked the start of their movement towards traditional British music, which led Ian Matthews to depart and form Matthews Southern Comfort. A month before the release of Unhalfbricking the band's van was involved in a motorway crash in which Martin Lamble was killed. However, they survived this major setback. Dave Swarbrick came in, initially as a session man, but he became a permanent member. Dave Mattacks replaced Lamble on drums. This revised line-up produced Liege And Lief, which is regarded by some as the finest British folk-rock album. In November 1969 Ashley Hutchings left the band to form a new group which didn't really get off the ground because he suffered a nervous breakdown. From now on Fairport Convention's fortunes became decidedly patchy. Line-up E lasted a little over a year and recorded two albums - Full House and Live At The LA Troubadour - but then Richard Thompson left to do solo and session work and Simon Nicol took over on lead guitar. Full House was notable for a nine minute version of Sloth, a mini-epic reflecting on War on which Swarbrick and Thompson alternate verses before the the song builds up to an impressive crescendo of guitar and fiddle. The 1971 line-up recorded a couple more albums - Angel Delight and Babbacombe Lee - but then Simon Nicol left and shortly after joined the Albion Country Band. The next year was a particularly unstable one for the band. Roger Hill, a veteran of the Birmingham rock scene replaced him, but returned to the Midlands just a few months later. Dave Mattacks also decided to leave and Tom Farnall, who had played in Midland dance bands, came in to replace him but he, too, made tracks back to Birmingham after just three months. David Rea was then flown in from California to replace Roger Hill on guitar, but his style was too American to gel with the rest of the band and he was on his way after little more than a month, too. Eventually, in August 1972, Dave Mattacks rejoined the band and Trevor Lucas (formerly in Fotheringay, who he had left to become a producer for Island Records) came in on guitar along with New Yorker Jerry Donahue, who'd also played in - the band had found a stable line-up at last. 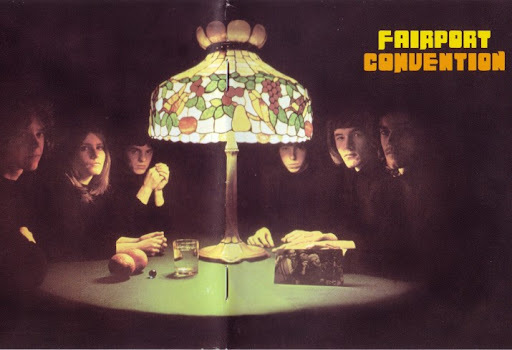 The Rosie and Nine albums were recorded andThe History Of Fairport Convention was released in this period too. In March 1974 Sandy Denny returned to the fold, having played in Fotheringay and enjoyed a three year solo career. She married Trevor Lucas. The two had been together for some time. Dave Mattacks left again in January 1975 becoming part of the Sussex-based folk band Etchingham Steam Band, which also included Ashley Hutchings and later evolved into Albion Dance Band. With a European tour in the offering Paul Warren was recruited on a temporary basis but left immediately the tour was over. He was replaced by drummer Bruce Rowland (previously with Joe Cocker and Ronnie Lane) for Rising For The Moon. After this album, Denny, Donahue and Lucas all left and the band dropped Convention from their name (not for long though, it was re-adopted in March 1977) and recruited three newcomers for the Gottle O'Geer album (line-up N), though they didn't hang around long afterwards. Roger Burridge and Dan Ar Bras both went on to play for Alan Stirell and former Wizzard piano man Bob Brady headed back to Birmingham. Sandy Denny sadly died of a brain haemorrhage on 21 April 1978 after falling down the stairs at a friend's home. The band continued to record albums well into the eighties. Thank you Oleg, This debut often gets eclipsed by the great work the band did when Sandy Denny joined. But Judy Dyble was a fine singer as well.